LONDON (The Guardian/Pacific Media Watch): Global media magnate Rupert Murdoch argued strongly for a war with Iraq in an interview recently. Which might explain why his 175 editors around the world are backing it too, writes Roy Greenslade. And what of News Corporation's small outposts in the Pacific's Fiji Times and the Post-Courier? What a guy! You have got to admit that Rupert Murdoch is one canny press tycoon because he has an unerring ability to choose editors across the world who think just like him. How else can we explain the extraordinary unity of thought in his newspaper empire about the need to make war on Iraq? After an exhaustive survey of the highest-selling and most influential papers across the world owned by Murdoch's News Corporation, it is clear that all are singing from the same hymn sheet. Some are bellicose baritone soloists who relish the fight. Some prefer a less strident, if more subtle, role in the chorus. But none, whether fortissimo or pianissimo, has dared to croon the anti-war tune. Their master's voice has never been questioned. Murdoch is chairman and chief executive of News Corp which owns more than 175 titles on three continents, publishes 40 million papers a week and dominates the newspaper markets in Britain, Australia and New Zealand [and the South Pacific]. His television reach is greater still, but broadcasting - even when less regulated than in Britain - is not so plainly partisan. It is newspapers which set the agenda. It isn't always clear exactly what Murdoch believes on any given issue, but this time we know for certain, courtesy of an interview in the Australian magazine, the Bulletin (which, by the way, he doesn't own). To cite the report of that interview in Murdoch's own Sydney Daily Telegraph, the "media magnate...has backed President Bush's stance against Iraqi leader Saddam Hussein". Indeed, his quotes are specific. "We can't back down now, where you hand over the whole of the Middle East to Saddam...I think Bush is acting very morally, very correctly, and I think he is going to go on with it". Then came words of praise for Tony Blair. "I think Tony is being extraordinarily courageous and strong... It's not easy to do that living in a party which is largely composed of people who have a knee-jerk anti-Americanism and are sort of pacifist. But he's shown great guts as he did, I think, in Kosovo and various problems in the old Yugoslavia." Pictured: New Zealand protesters for peace. Most revealing of all was Murdoch's reference to the rationale for going to war, blatantly using the o-word. Politicians in the United States and Britain have strenuously denied the significance of oil, but Murdoch wasn't so reticent. He believes that deposing the Iraqi leader would lead to cheaper oil. "The greatest thing to come out of this for the world economy...would be $20 a barrel for oil. That's bigger than any tax cut in any country." He went even further down this road in an interview the week before with America's Fortune magazine by forecasting a postwar economic boom. "Once it [Iraq] is behind us, the whole world will benefit from cheaper oil which will be a bigger stimulus than anything else." So there was the maestro's music. What then of his editors' lyrics? His single paper in the United States is the New York Post, a raucous tabloid which doesn't sell as well as its rival but makes more than enough noise to be heard far and wide. Its editor, Col Allen, is Australian, as is its leading polemicist, Steve Dunleavy, a long-time Murdoch acolyte. A series of gung-ho front pages have been backed up by vehemently pro-Bush articles inside. A typical example, by a retired US army intelligence officer, Ralph Peters, heaped praise on a "flawless" Colin Powell for doing "a superb job" in revealing "hard evidence" which justified war on Iraq. Peters assailed "the world's do-nothings" and "Saddam's apologists", such as France, which he alleged was "desperately trying to protect its client in Baghdad". This was a precursor to a front-page assault by Dunleavy on France as part of the "axis of weasel". Americans had died freeing Europe of Hitler but the French wouldn't fight "today's Hitler", Saddam. A picture of second world war graves in Normandy was headlined "Sacrifice: They died for France but France has forgotten". I doubt that Murdoch disagreed with form or content. Nor could he have much to complain about with the recent attitude towards the war adopted by his British tabloid flagship, the Sun. The editor, Rebekah Wade, has been much more forthright than her predecessor in supporting Blair and Bush. In a return to the Kelvin MacKenzie era, the Sun has also enjoyed putting the boot into Britain's old enemies across the Channel, decrying the "three stooges": France's Jacques Chirac, Germany's Gerhard Schröder and the "pipsqueak Belgians". Instead, in a pro-American fervour which is echoed in virtually every Murdoch publication, it urged Blair on Friday to "stick with the friend you can trust through and through - America". How lucky can Murdoch get! He hires 175 editors and, by remarkable coincidence, they all seem to love the nation which their boss has chosen as his own. The papers he owns in the country of his birth, Australia, are noticeably more muted than the New York Post and the Sun. But it doesn't require a semiologist to see that the leader-writers are attempting to break down stubborn public opinion: some 39% of Australians oppose a war, even with UN backing, while 76% oppose a war unless there is full-hearted international support. Even so, the insistent message on the editorial pages of the five largest Murdoch papers in the main Australian cities - Sydney, Melbourne, Brisbane, Perth and Adelaide - is that Bush is pursuing the right path. These papers show their colours by giving unswerving support to the rabidly pro-American prime minister John Howard, who has sent troops to the Middle East, and heaping scorn on the opposition leader, Simon Crean, for what the Melbourne Herald Sun calls "political opportunism" in opposing war. 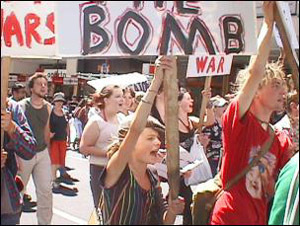 Anti-war demonstrators have also been derided. The Advertiser in Adelaide took the organisers of one protest to task because they had supposedly advocated civil disobedience. The Sunday Times in Perth disparaged unions for threatening industrial action should there be a military strike on Iraq. One Australian media-watcher said that all the papers' right-leaning columnists have been given licence to bang the war drums while belittling opponents. Space has been given to pro-war contributors, too. In the Brisbane Courier-Mail, churchgoer Geoff Hines urged Christians to support an invasion because "there is such a thing as a holy and just war". Murdoch's national title, The Australian, is regarded as more sober than the city papers, and it's true that many of its leading articles are masterpieces of fence-sitting waffle. But that isn't true of the latest crop and there cannot be any doubt where its editor, Michael Stutchbury, stands. The daily slogan, "Countdown to war", suggests that the paper is cheerleading the inevitability of an invasion, as did one of its more militant leaders two weeks ago. "Twelve years of defiance by Hussein show that the old policies of containment no longer work", said the editorial. "Appeasement is not an option when it comes to dealing with Hussein...Failure to disarm Hussein would make the world a much more dangerous place." On Saturday, the paper called on readers to "accept that the US is not the aggressor on the world stage, and that the real threat to the safety of the Australian people comes from Baghdad and Pyongyang", and took a sideswipe at anti-war demonstrators. In New Zealand, there is widespread hostility to the war. Its government, led by the prime minister, Helen Clark, is trying to maintain a neutral stance. But Murdoch's papers are eager to push readers and politicians towards belligerence. The influential Wellington Dominion-Post argued last week: "There is always a temptation to take every means to avoid the carnage of war. Yet there also comes a point at which appeasement itself is little more than a charade...The doubters must say how much more time they would give Saddam to play his delaying games." In London, The Times and The Sunday Times have left none of their readers in two minds about their pro-war sentiments, despite the overwhelming popular opposition to war. It is fascinating to note that papers which acknowledge that the British people's distaste for war is partially due to anti-Americanism are trying to change their minds by appealing to an older form of prejudice, Francophobia. The Times, for instance, last week used its strongest language during this so-called phoney war to admonish the French president. Taunting Chirac for his opposition to what the French supposedly "Wrongly depict as a relentless American juggernaut", The Times concluded that he is leading France into a cul de sac and has therefore consigned it to "unsplendid isolation in the anteroom occupied by history's losers". The Sunday Times also laid into the French and Germans, claiming that to adopt their attitudes "would be, to adapt the three wise monkeys, neither seeing, hearing nor acting on a brutal regime that defies the UN". An earlier Sunday Times leader revealed the truth about the worldwide struggle of the Murdoch press to secure the hearts and minds of its millions of readers. "Winning the public-relations battle is almost as vital as military victory," said The Sunday Times. So that's what the editors have been doing then. Needless to say, my attempts to discuss the oddity of Murdoch's editors all agreeing with their boss failed. No editor returned calls or emails. Finally, though, a word of praise for one of Murdoch's smallest papers, the 28,000-circulation Papua New Guinea Post-Courier. Its editorials in the past two weeks have been about domestic affairs, but it did publish a militant anti-war message: "The UN inspectors have so far not found any weapons of mass destruction in Iraq. How can a civilised country attack another country without any proof of misconduct?" It was, of course, a reader's letter, but what a breath of fresh air beside the war cries in the rest of Murdoch's press. © 1996-2003 Copyright - All rights reserved. Items are provided solely for review purposes as a non-profit educational service. Copyright remains the property of the original producers as indicated. Recipients should seek permission from the copyright owner for any publishing. Copyright owners not wishing their materials to be posted by PMW please contact us. The views expressed in material listed by PMW are not necessarily the views of PMW or its members. Recipients should rely on their own inquiries before making decisions based on material listed in PMW. Please copy appeals to PMW and acknowledge source.